Christina Hendricks carried a Thalé Blanc handbag during the Lost River photocall at the 67th Annual Cannes Film Festival earlier today! 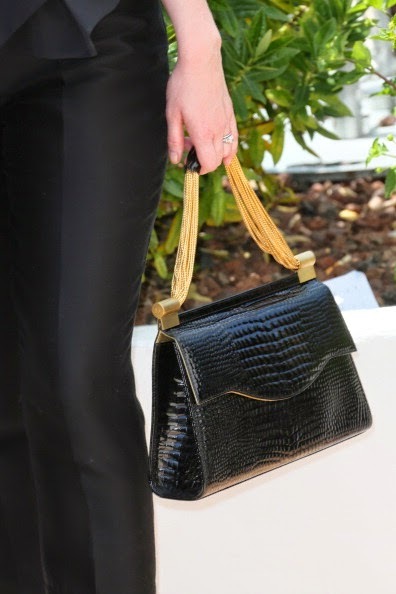 The gorgeous actress looked chic in a pantsuit and Thalé Blanc's Tiffany handbag in Black Embossed Leather with Gold and Nickel Hardware ($1,095, www.thaleblanc.com). See more of Christina Hendricks here on Apparel Search. You may also want to check out Taylor Schilling with her Thalé Blanc clutch. Thank you for taking the time to read our handbag blog post. We hope that you have found this news to be informative. See more Cannes fashion blog posts.